CHICAGO -- The Milwaukee Bucks showed why they are the best team in the NBA by scoring a convincing 112-99 win over the Chicago Bulls on Monday night at the United Center. Giannis Antetokounmpo finished with 29 points, 17 rebounds and eight assists to lead the way while Kris Middleton added 16 points and four boards. Point guard Eric Bledsoe chipped in 19 on 3-for-6 shooting from 3-point range..
After leading narrowly at the half, 50-49, the Bucks took control in the second half to score their 42nd victory in 56 starts. Milwaukee made only 12 of 38 triples (31.6 percent) but shot 38 of 80 from the field overall (47.5 percent) The Bucks also converted 24 of 29 free throws and out-rebounded the Bulls 49-45. .Zach LaVine led the Bulls with 27 points and seven dimes while Lauri Markannen added 20. Otto Porter Jr., who was acquired from the Washington Wizards during last week's trading frenzy contributed 18 points and seven boards. At 13-44, the Bulls dropped to 13th place in theEastern Conference. They have lost eight of their last 10 outings. GREEK TREAT. 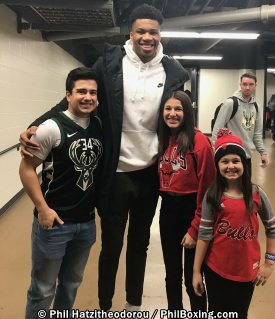 MVP candidate Giannis Antetokounmpo once again showed that he is a fan-friendly superstar. After the game, when he visibly looked tired after logging 35 minutes, he still took the time to meet some of his fans who watched the game at the famous arena. Among the lucky ones were Eraklis Labrakis, Victoria Georgelos, and Eva Georgelos, who are all from the Chicago suburbs but are of Greek heritage. Photo: The Greek Freak poses (with From L to R) Eraklis Labrakis, Victoria Georgelos and Eva Georgelos. (PhilBoxing photo by Phil Hatzitheodorou). Click here to view a list of other articles written by Phil Hatzitheodorou.